Shouldn’t a maintenance crew have enough resources to maintain the integrity of Vision Zero safety projects and Philadelphia’s bicycle network? We think so. That’s why the Bicycle Coalition has long been advocating for increased funding of the Streets Department operating and capital budgets to increase the installation of higher quality bike lanes, cut down Philadelphia’s 1000 mile street paving backlog and advance Vision Zero projects. 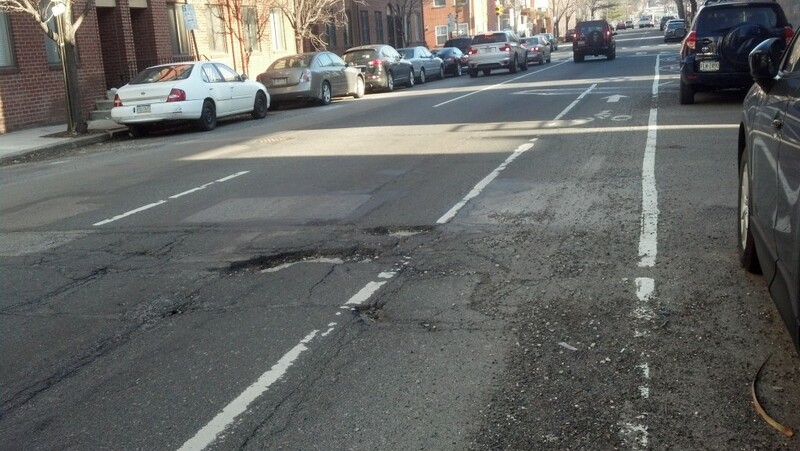 Since 2014, we’ve been documenting how Philadelphia has fallen behind its peer cities by not investing enough in its Streets budget, including staff and paving. The Nutter and Kenney Administrations have responded to our advocacy and recognized the problem by increasing the capital budget, adding a new paving crew in FY18 and a Vision Zero maintenance crew in FY19, accelerating new Vision Zero projects with increasing budget funds and supporting the adoption of a new vehicle registration fee by City Council to pay for street safety. The Streets Department cited budgetary reasons for rejecting BCGP’s call for the use of traffic separators on 27th Street. 13th & 15th Streets Neighborhood Bikeway: After winning a grant in 2014 to create the City’s first neighborhood bikeways, the Streets Department was still unable to finish the treatments during the 2018 paving season. Flex posts on protected bike lanes around the city are in poor condition and should be replaced. Miles of identified faded bike lanes remain un-refreshed. As the FY20 capital budget is put together by the Administration, we propose that a dedicated source of funds be created to complete and maintain bicycle infrastructure to a good state of repair. The Administration should create a dedicated budget line item for bicycle infrastructure and Vision Zero project supplies. Tell Mayor Kenney: Dedicate $500,000 for Vision Zero and Bikeway Network Supplies in the Fiscal Year 2020 Streets Department capital budget and prioritize bicycle infrastructure construction and maintenance!